There are so many new and exciting updates happening at Walt Disney World right now! Even for me, someone whose job is to keep up with all this news, it’s hard to keep it all straight. So here is a master list of everything we know now. This is everything that has been officially released and confirmed by Disney. I’ve sorted them by location, parks, Springs, and resorts. I’ll keep this list updated so you can bookmark this page. It’s easy to miss updates so if you see anything you think is incorrect on this list, drop me an email and let me know. New Theme for 2019: The new theme and hashtag for 2019 is “Now More Than Ever” and it will be focused on celebrating Mickey Mouse, and bringing that into all the parks. There’s even an official countdown for this, which you can visit here. Skyliner System: This one goes in this category, as it will affect many areas of the parks and resorts. This new gondola system will connect Disney’s Hollywood Studios and Epcot to four resort hotels- Art of Animation Resort, Pop Century Resort and Caribbean Beach Resort as well as the upcoming new DVC property, Riviera Resort. Status: The support towers are in place, cables are going up, and the Skyliner boarding stations are under construction. 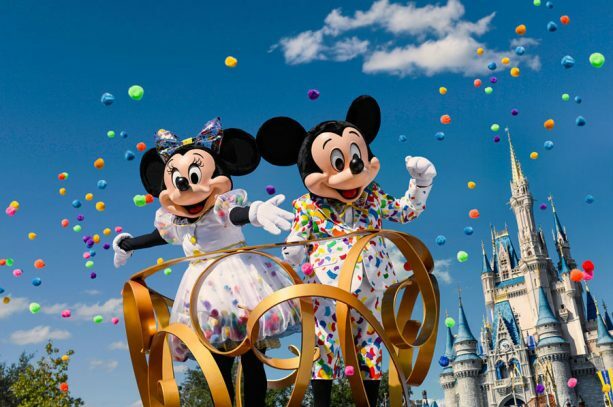 Mickey & Minnie’s Surprise Celebration: Mickey & Minnie’s Surprise Celebration will feature new food, merchandise, and entertainment, including a new dance party with Mickey, Minnie and their friends. Mickey and Minnie will greet guests together inside Town Square Theater, sporting all-new colorful outfits for their special celebration. This new meet and greet location will also have a guestbook to sign. Move It! Shake It! MousekeDance It! Street Party Parade: Replacing the current Move it, Shake It Parade, sounds pretty similar except new music, new outfits, and with a focus on Mickey Mouse. An all-new song, “It’s a Good Time,” will play several times daily as part of the new parade. Other characters will also be there including Donald Duck, Daisy Duck, Goofy, and many others. Timeframe: Begins January 18th and will run daily indefinitely. Tron Lightcycle Ride: Coming to Tomorrowland in between Space Mountain and the Tomorrowland Raceway. This is Shanghai Disney’s biggest attraction and having it come to WDW is so exciting. A definite intense thrill ride with a large footprint, this will be a huge addition to Magic Kingdom’s park. Timeframe: No specific date released, will be completed by 2021. A redesigned main entrance area: Between the entry and Spaceship Earth. The Leave-A-Legacy photos (those tombstone like things that are there now) will be relocated outside of the park entrance. So for those that worried they would lose their photos, they’ll still be there, just moved to a new location. Once those are moved it opens up all that space for new pathways and green spaces as well as a newly re-designed fountain. If you zoom in you can see how great it all looks. I’m imagining riding over this area on the monorail and how pretty it will be. Not only more aesthetically pleasing but it should also have a much better crowd flow for entering the park. PLAY themed pavilion in Future World: The new pavilion will be located in the redesigned domed building previously known as Wonders of Life. This building is only used seasonally for some of the Festivals as you can see pictured below. We don’t have a name of this new pavilion, but it will be themed around the “power of PLAY”. Disney describes it as an “immersive and interactive city where you can explore, create, and interact with some of your favorite Disney characters.” This city will have unique interactive experiences, hands-on activities, and engaging entertainment. Timeframe: Officially none has been given. But info from the job listings hints at possibly Spring of 2019. Ratatouille Ride: The Ratatouille ride at the France pavilion now officially has a name: Remy’s Ratatouille Adventure. It’s a ride that’s already in Disneyland Paris. A family-friendly 3-D attraction that moves you through 3-D screens while you’re shrunk down to rat size. Timeframe: Officially sometime by 2021 but rumor is late spring/summer of 2019. Illuminations Ending: The long-running show will be wrapping up at the end of summer, 2019. While we don’t know the exact date, Disney has made it sound as though there won’t be a break where no nighttime show will run, but the interim show Epcot Forever will immediately begin once Illuminations ends. Epcot Forever: Once Illuminations ends, and before the new one begins in 2020, there will be a limited time show running for the year or so in between. “Epcot Forever” will feature classic Epcot tunes starting with a spark of imagination that swells into an epic spectacle of fireworks, music, lighting, lasers, and special effects kites. Illuminations Replacement: This new show will celebrate how Disney music inspires people around the world, and will feature massive floating set pieces, custom-built LED panels, choreographed moving fountains, lights, pyrotechnics and lasers. Rumors say this technology will be new to Disney parks and they’re looking for ways to really bring it to a whole new level of immersion for guests. There’s lots of options and space for them to use so I’m excited to see what they come up with. Timeframe: All we know is sometime in 2020. Beauty and the Beast Sing-Along: a new guest offering will soon debut at the France pavilion at World Showcase (in addition to “Impressions de France”) – a brand new “Beauty and the Beast” sing-along created by Don Hahn, producer of the animated and live-action “Beauty and the Beast” films. Images show this will be modeled after the live-action version and not the animated one. Japanese Signature Restaurant: They are currently adding on to the Japan pavilion to open a Signature Dining experience “inspired by the natural beauty of Japan”. Mitsukoshi USA will operate the new restaurant (as it currently runs the Pavilion’s merchandise, Table Service restaurants, and kiosks). Guardians of the Galaxy Coaster: This is currently being constructed where Universe of Energy used to be. You can’t miss it, as the building is so large it can be seen from the whole park. The size of this ride is staggering- the foundation for the new attraction is the largest concrete pour Disney’s ever done, and you could fit four Spaceship Earths inside the ride’s show building. This indoor roller coaster will be the world’s first “storytelling coaster”, with the train cars making sure riders are fully immersed in the story, and aren’t just zooming past it on the tracks. These new coaster cars will be fully motion-controlled and will feature a 360-degree spinning motion so that the ride will control where guests are looking. New park logo: 2019 will be the 30th anniversary of Hollywood Studios so they’re starting the year off with a big change, introducing an all-new logo for the park that will incorporate its new direction of celebrating movies and animation. Incredibles comes to Pixar Place: The entire area will be transformed into Metroville, the world of The Incredibles. There will be a dance party similar to what they used to have in Tomorrowland, you can meet Edna Mode, photo ops, and more. Mike & Sully Meet and Greet: They’ll be at Walt Disney Presents where Star Lord used to be. Lightning McQueen’s Racing Academy: A new show that’ll put you right in the middle of the Cars universe. Located near Rock n Roller Coaster, we are assuming it’s in the building that’s used seasonally for special events that’s in between the coaster and Tower of Terror. Lightning demonstrates what he’s learned over the years by using his brand-new, state-of-the-art racing simulator and its wraparound screen. After the show, you’ll even have the chance to snap a photo with trainer-turned-racer Cruz Ramirez just outside the Academy. “Wonderful World of Animation” Show: a nighttime show, debuting as part of the park’s 30th Anniversary celebration. The show will use state-of-the-art projection technology to celebrate 90 years of Disney animation, all beginning with Mickey himself. No word on where this show will happen, but the artist’s rendering shows the Chinese Theater, so we’re thinking it will be located in the center of the park, where the current fireworks and projection shows happen, and not as a replacement for Fantasmic. Mickey & Minnie’s Runaway Railway: This attraction is being built in the former Great Movie Ride location. It will bring a two-dimensional cartoon into a real-world experience. The first-ever ride-through attraction themed to Mickey Mouse will have an original story and theme song as it takes guests on a journey through the Disney Channel’s “Mickey Mouse” cartoon shorts. Status: Currently under construction, but the front of the Chinese Theater is now free of construction walls. “Millennium Falcon: Smuggler’s Run” – This will be the headliner attraction in the new land. Hondo Ohnaka and Chewie borrow the Falcon and recruit guests to take on one of three unique roles in the cockpit. Rumors say it will use similar tech like Flight of Passage to make you feel as though you are really flying the Falcon through space. New video released here. “Star Wars: Rise of the Resistance” -Guests are captured by the First Order and will face off against Kylo Ren. New teaser video here. Also in this new land, guests will be able to visit a street market (merchandise store), shop at food stalls (snack kiosks) for Star Wars classics like blue milk, and visit the Cantina and see DJ Rex (new quick service restaurant), as well as encounter and meet characters from the Star Wars universe. It was also revealed that composer John Williams is creating original music for the new land. You can hear a snippet of the new Galaxy’s Edge theme in this video. Timeframe: Disney has announced Late Fall of 2019. “Fall” in WDW terms can mean anything from September 1st to mid-November. If you want to be sure Star Wars Land is open next time you visit Disney World, I’d say late November or early December of 2019 is the earliest you should plan to come. Hakuna Matata Time Dance Party: a family-friendly event featuring music, dance, games and some of your favorite Disney friends—including Timon and Rafiki. Daily on the Discovery Island stage. Timeframe: Begins Jan. 18th, 2019. The tower at Coronado Springs: The tower will be 15 stories tall, with a two-story lobby (pictured above), and a roof-top table service restaurant. A second new restaurant will also be added, located on an island in the middle of the resort’s 14-acre lake, Lago Dorado. New walkways will stretch across the lake, allowing quick and convenient passage to and from all areas of the resort. All of the 1,800-plus existing rooms are also being updated with new fixtures, furnishings, and lighting. An all new color palette will tie the entire resort together when the tower opens, with a total room count of more than 2,400. DVC “Disney Riviera” Resort: This one will be next door to the Caribbean Beach Resort and is set to open in Fall of 2019. The theme is inspired by the European grandeur Walt Disney experienced in his travels along the Mediterranean coastline. This new resort will also be connected to the new Skyliner Gondola system. Reflections – A Disney Lakeside Lodge: A new nature-themed resort which will be located on Bay Lake between the Wilderness Lodge and the Campgrounds. This will be a deluxe resort, and will include more than 900 hotel rooms and proposed Disney Vacation Club villas spread across a variety of unique accommodation types. Star Wars Resort: This resort will be directly linked to the new Star Wars Galaxy’s Edge Land at Hollywood Studios. It will be unlike any resort experience you’ve ever seen. From the moment you board your launch pod, it’s a fully-immersive, multi-day Star Wars adventure aboard a luxury starship complete with high-end dining, space-view cabins and all of the exciting action you would expect from an authentic Star Wars experience. See why I’m excited about here. Timeframe: Unknown but won’t be open before the new Land will as the construction isn’t that far along. Wolfgang Puck Bar and Grill: The Wolfgang Puck Bar & Grill will “modernize the traditional bar and grill concept” in a location designed by Tony Chi. The menu will highlight many of Puck’s signature dishes along with handcrafted specialty cocktails, beer, and wine. Located next to the Coke Store across from Chicken Guy. City Works Eatery & Pour House: It’s said to be located near the NBA Experience which is being built where Disney Quest used to be, on the Westside. It’s still not totally clear if this is replacing the original plans for the NBA place, or if this will be connected to it since the concept arts seem to use the same space. So maybe this will be the restaurant and the NBA Experience will be the games and such…? I guess we will hear more about it soon. But City Works is said to specialize in craft beers, and the restaurant and bar will offer plenty of high-def TVs including a 165-inch screen, perfect for viewing your favorite live sporting events.